Smooth, firm and fresh green, the bullet-shaped jalape�o is thick-fleshed with slight characteristic cracks near its stem end. Slightly tapered and blunt-tipped, this small- medium size pepper has dense flesh for its size. The crisp, juicy flesh offers a powerful bite, despite its relatively low heat scale rating. Jalapeno chile peppers can be served fresh, cooked or pickled. Add diced fresh jalapeno to cornbread, couscous, chili, sauteed corn and beans, even sweet desserts such as an apple dutch baby. Pickle peppers with garlic, salt, spices and vinegar. Halve peppers, stuff with cheese and bake. Combine diced jalapeno with green tomatoes, garlic, sugar, spices and cook down into jam. Dice peppers and add to chopped fresh tomatoes and cilantro for salsa. 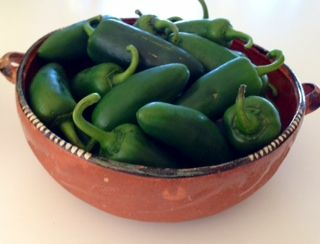 Jalapeno may be added to a variety of dishes for a mild heat. It's been difficult to find jalapenos in Connecticut that are in the good condition that I am used to from living in the southwest for 13 years; these peppers meet all expectations.